Earlier this year my crew got to review Heirloom Audio Productions In Freedom’s Cause Audio Adventure. Since our review, we’ve listened to that Audio Adventure several times on long car rides. Each time, my history buff son asks if we can get any other similar audio adventures. When With Lee in Virginia arrived for review he could not wait to begin listening. The Civil War is one of his favorite topics! After our experience of getting stuck in the car multiple times while listening to In Freedom’s Cause for the first time (because we were all unwilling to pause the story even for a few minutes on errand running day) I declared that we would save the new cds for our upcoming long vacation drive. As we left on that vacation, I barely made it out of the driveway before the children were begging to start With Lee in Virginia. As with our last Heirloom Productions cd, we all listened, rapt for over two hours! We loved following along as Vincent, a young man from a Southern Plantation, navigates the realities of slavery and the Civil War. It was an exciting story full of action, courage, honor, and duty. We loved it so much we listened again on the way home from that vacation trip too! With Lee in Virginia comes with access to a special bonus area perfect for homeschooling families! My son loves the With Lee in Virginia mp3 files, which I put on his iPad so he can listen to the story over and over as often as he wants. Several of my children enjoy the original G.A. 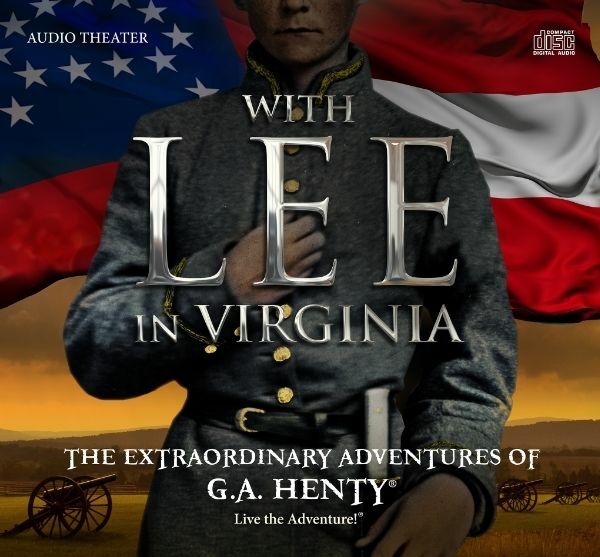 Hently With Lee in Virginia book in ebook format which is included in the special bonus area- with redesigned illustrations! Plus a the original soundtrack, a cast poster, a printable Robert E. Lee quote and a newsletter website. Best of all, on the special bonus page, is a study guide and discussion starter ebook to use alongside With Lee in Virginia. My family, enjoys listening to the story once straight through- because we can’t stand to turn it off even for a few minutes for discussion that first time! But, on subsequent listenings the study and discussion questions are wonderful. ‘Listening Well’ offers comprehension questions to check understanding. I find this especially important for my younger listeners who often need some clarification, but don’t know how to ask. ‘Thinking Further’ questions provide in-depth and thought-provoking questions for discussion. I also think the questions would be perfect for written essay answers, or even as a prompt for research papers. Many questions provide the opportunity to discuss faith. One of my favorite discussion questions was, “By helping Tony escape, is Vincent breaking the law? Is he doing the right thing?” ‘Defining Words’ list many vocabulary words for each chapter. Have a dictionary handy! I often had to look up several of the words myself! I give Heirloom Audio Productions’ With Lee in Virginia two thumbs up! My children more than agree. You can’t go wrong with this dramatized adventure- especially if you have a long car ride coming up. Want to hear what others on the Review Crew Team thought of this fun Audio Production? Click below. Connect with Heirloom Audio Productions on Facebook, Twitter and Google +Or check out the With Lee in Virginia Facebook page.